I flew to China late last fall for the Chongqing Global Travel Agent Conference, so my mind was on meetings and seminars and “taking care of business” rather than sightseeing. The Radisson Blu Plaza Chongqing, 22 Nan Bin Road, Nan’an, Chongqing, China, was the perfect place to hang my hat. Not only was the location convenient (an inexpensive, short cab ride from the convention center), but the hotel had just what I needed: free WiFi, well-placed electrical outlets, a spacious work surface — and a great view across the Yangtze River to distract me from my laptop screen. If I’d had more time, I would have explored the metropolis of some 8 million via the nearby stop for Metro Line 3. 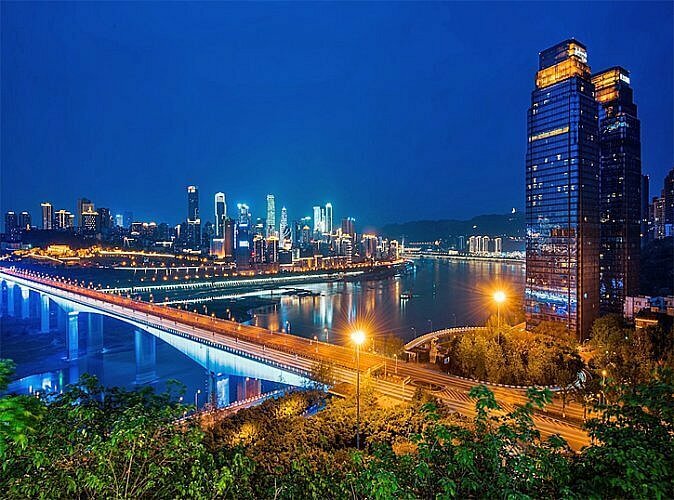 Chongqing is a municipality administered by the central Chinese government — but it’s not a municipality in American terms. Although the urban core — where I was — looks like megalopolises worldwide, there’s more to this city. One of four such municipalities in China (Beijing, Shanghai and Tianjin — all on the coast — are the other three), the total population is more than 30 million in an area that’s about the same size as Austria. 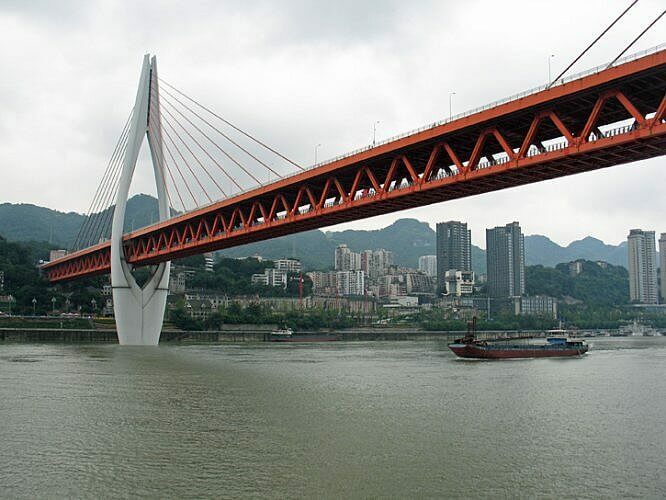 Speaking of the Yangtze River, most Western tourists know Chongqing because it’s the launching point for almost all of the Yangtze River cruises. The city was the wartime capital of the Republic of China during the Second Sino-Japanese War (1937–1945), and is filled with museums and monuments relating to its pivotal role in history in the 20th Century. In the 21st, it’s a major manufacturing center and transportation hub — and, now, the largest municipality in China. 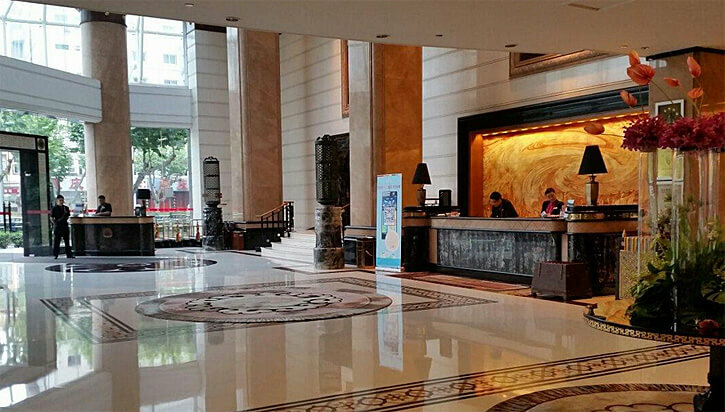 The Radisson Blu Plaza Chongqing has 308 hotel rooms and suites in two towers, plus all sorts of venues for meetings, seminars, wedding and other events. The fitness center has floor-to-ceiling windows with a killer view plus a separate indoor swimming pool. Four restaurants hit every culinary craving. Bin 22 is a bar-with-snacks options. Shiki (on the 37th floor) is a Japanese teppanyaki restaurant and sushi bar. Cantonese and Sichuan specialties are served up in the Ya Yuan Chinese Restaurant. The extensive breakfast buffet (with Chinese and Western choices) is served in the River Café, which also offers buffets at lunch and dinner. In addition to the free WiFi in the guest rooms, there are LCD televisions and bathrooms with rain showers and bathtubs. My room — one of 112 in the “superior” category — also had a minibar, coffee and tea-making facilities, a safe-deposit box with laptop charger inside, and (best of all) a bed with a goose-down duvet and feather pillows. Although I wasn’t in a rush to leave, the hotel does offer Express Check-Out as well as the possibility of staying in one’s room as late as 6 p.m. (subject to availability, of course). 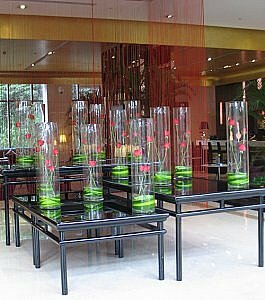 Instead of one large vase of flowers in the lobby, the Radisson Blu Plaza Chongqing set out many individual blooms. Rooms start about $85. 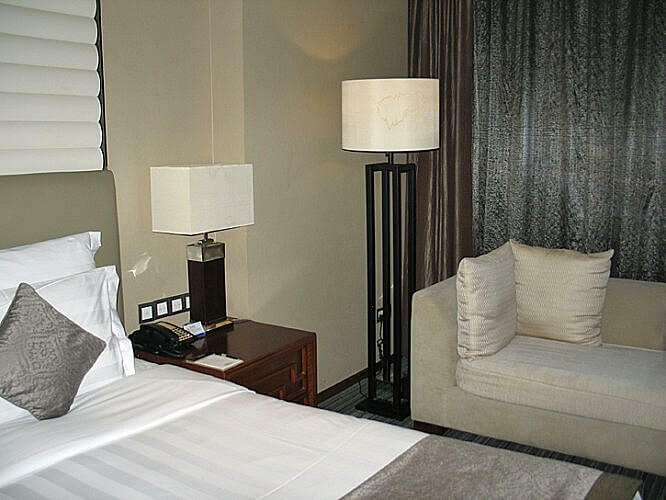 You can make a reservation on the hotel’s website or via one of the usual hotel booking sites like Expedia.